Easy way to check your cable/DSL or wireless Internet connection's WAN IP by using MyWANiP utility or iGoogle gadget. Why did I say that? It's because most of the time it’s easy for you to know the IP of your computers, but if you need to check what’s the public IP of your home network, it's not that simple, you usually need to log on to you home network router (Linksys, Dlink, Netgear or other brands of router) to find the answer. Manual checking this public IP on router can be annoying sometimes if you are not that IT savvy, especially when somebody needs to connect to your computer for helping you to do some computer troubleshooting or access your web server from Internet frequently. In addition, it will be troublesome too if the router is not managed by you, then you need to get help from the router administrator. So, you need some handy utility to help you in this case, and it's pretty to do it. Without wasting more time, let’s start to find the public IP by clicking this MyWANiP URL link. You will get the public IP details of your existing network instantly. After that just compare with the one you got from your router if you want, both IP addresses should be the same. If you don’t like to make checking from Internet every time, you can download this MyWANiP, simple WAN IP checker. Install the utility, then just run the application, it will detect and show you the public IP. It’s that simple.. 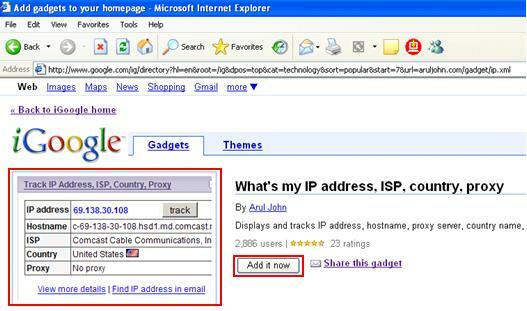 Note: If you love to use iGoogle to google words, then you can add this IP address tracking gadget to track your WAN IP. Just click Add it now button to add it and you will see that left hand IP tracking window on your iGoogle home page later. Pretty easy to use!